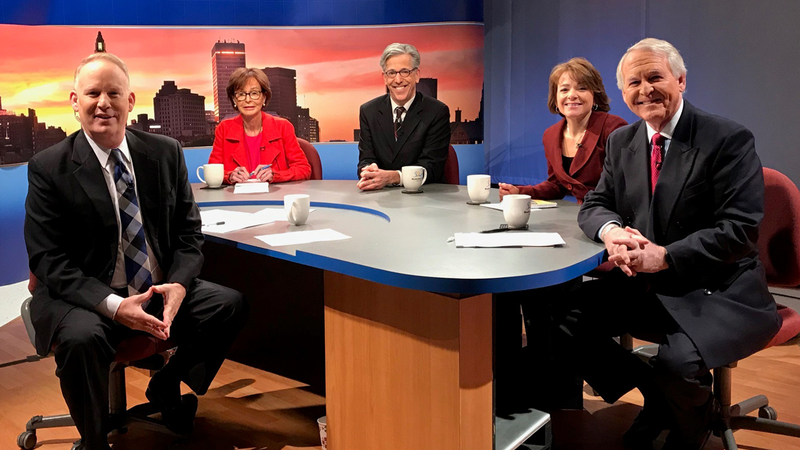 In a year of political ups and downs, hidden high jinks and exposed shenanigans, allegations and consequences, rumors and resignations (in other words, Rhode Island politics as usual) A Lively Experiment reviews the headlines of 2017, as well as stories below the fold, during its regular program on Friday, December 29 at 7 p.m., with encore on Sunday, December 31 at noon. "We say all the time this is the fastest 30 minutes on television, but this special episode is also among the most fun to produce once a year," said Jim Hummel, award-winning journalist and moderator of A Lively Experiment. Hummel welcomes panelists (pictured left to right) Maureen Moakley, political science professor at the University of Rhode Island; Ian Donnis, political reporter at Rhode Island Public Radio; Wendy Schiller, political science professor at Brown University;and Dave Layman, corporate communications consultant. The panel will report their top local story, top national story, biggest winner and loser, and favorite "Only in Rhode Island" moment. Panelists will also offer their predictions for 2018. Episodes of A Lively Experiment are available online on the Rhode Island PBS YouTube channel. Subscribers to the YouTube channel are notified when a new episode is ready for viewing. Viewers can also continue the conversation on A Lively Experiment on Facebook and on Twitter. OUR TOWN 2018: Coming to Your Town Next?